Pyramid Raised Garden by Infinite Cedar at Tulips Orchids. MPN: PYRAMID7. Hurry! Limited time offer. Offer valid only while supplies last. PYRAMID7 Features: -Material: Naturally rot-resistant western red cedar. -Natural finish and can be stained. -Unique 7-level pyramid design. PYRAMID7 Features: -Material: Naturally rot-resistant western red cedar. -Natural finish and can be stained. -Unique 7-level pyramid design. -Provides the equivalent of 86 square feet of garden. -Allows for an average of 76 plants. -Sturdy construction cedar boards and stainless steel hardware. Material: -Wood. Color: -Natural. Shape: -Novelty. Drainage Holes: -Yes. Warp Resistant: -Yes. Rot Resistant: -Yes. Number of Tiers: -7. Number of Feet: -0. Capacity: -18304 Fluid Ounces. Country of Manufacture: -United States. Material Details: -Cedar. Dimensions: -Cedar thickness: 1". -Accommodates ground space size: 10.76 sq. ft.. Overall Height - Top to Bottom: -51". Overall Width - Side to Side: -58". Overall Depth - Front to Back: -58". Overall Product Weight: -78 lbs. Warranty: Product Warranty: -5 Year. 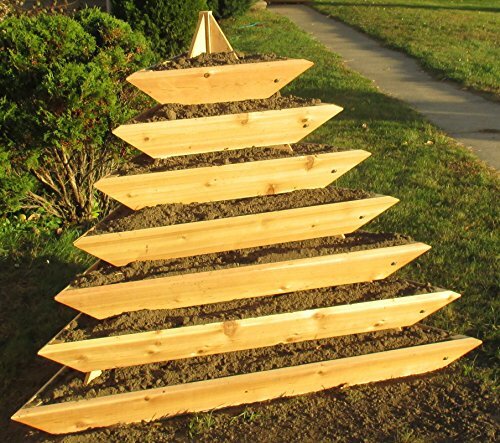 Unique 7-level pyramid design, Measures 58″ (width) x 58″ (depth) x 51″ (height); weighs 78 lbs.